80% of your practice time brings you only about 20% of your total progress. 20% of your practice time brings you only about 80% of your total progress. No, I didn’t just pull these numbers out of the air. These statements are based on Pareto’s Principle – (The 80/20 Rule). It would be too lengthy to go into detail about the origins and facts behind Pareto’s Principle here, but I strongly recommend reading the full story behind this great principle. Go to: about.com and then type in Pareto’s Principle in the search box. I’ll just tell you Pareto’s Principle has been proven true in many areas of human life, industries, economies, time management and many other areas of the human existence. It effects us all, not just in music, but in much of what we do and are involved in. 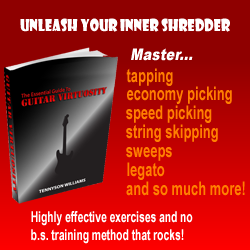 The basic idea, as it applies to guitar playing, is how long you practice is not always as important as what you choose to focus your practice time on. This is not about efficiency or time management. This is about obtaining “maximum effectiveness” with whatever amount of time you can invest into practicing. Lets say there are two guitar players (we’ll call them John and David), the first player (John) practices 30 minutes a day is making good progress and the other guy (David) practices 90 minutes a day and makes less progress than John. What are the two things you might expect David to say about John? In our example the first statement cannot be true. Although it is possible the second statement could be true in rare cases, it is not as likely as it would seem. David failed to see that John’s better results probably were due to what he focused on and how effective his practicing was.  Any weak area that is preventing your strengths from being used to the fullest potential, is a weakness you must overcome as soon as possible. These weaknesses are part of your important 20% that you should focus on, because overcoming these weaknesses will likely bring you 80% of the total progress you want.  Any weakness that does not interfere with the implementation of your strengths to the fullest potential is usually non-essential. These weak areas are part of your non-essential 80% of what you probably currently focus on (whether you are aware of it or not) that will likely bring you only 20% of the total progress you want. If you are having a hard time following this, it probably is because you have not sufficiently researched Pareto’s Principle. Again I urge you to check this out at the link above. If you change this one approach to your practice time on a consistent basis, your results will massively improve. You can accomplish a lot of positive forward momentum in your playing even if your practice time is limited. But please do not misunderstand me, I am not implying, in any way, that short practice sessions are as good as longer ones, nor that short practice sessions are a substitute for longer periods of serious practice time. What I am saying is “effective short practice sessions” can be very valuable when longer sessions are impossible. If you already know that tomorrow, you will have only 20 minutes of practice time possible, you might be tempted to just say, “forget it, what can I accomplish in 20 minutes? I’ll wait for the next day when I know I will have an hour to practice. Don’t do this to yourself, because daily consistency is the best fuel for forward momentum. Use that 20 minutes and pack it with practicing on what really matters, don’t sit around and play a bunch of stuff you already know how to do well.